Do you love to send or receive hand made cards? I know I do! I live in a very rural area in the mid west. There have been several times that I need a card for an occasion but I am not able to drive several miles to get the card. Thankfully I love to create cards and have the tools and supplies to do so. Thinking that others would be in the same situation, I have created monthly card kits. Each month five cards will be created with a variety of sentiments (i.e. thank you, birthday, thinking of you, etc.) You just need to SIGN, adhere a postage STAMP and SEND. 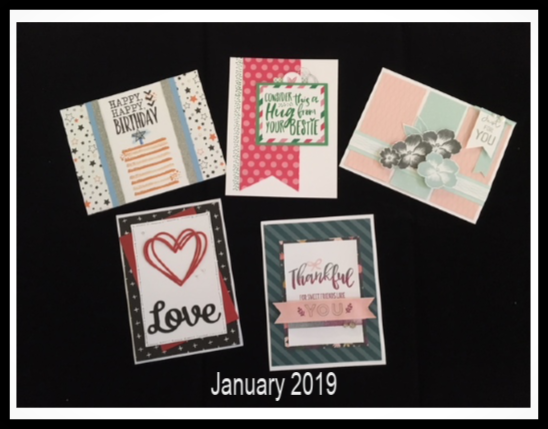 The monthly card kits are available for $15.00 per month (shipping included) and will be sent by the 20th of each month. USA only and pay by paypal. Please PM to obtain your kit. You will love each card as will the individual receiving them!